An interview with Sasakawa USA’s Dr. Phyllis Yoshida, Fellow for Energy and Technology, recently was featured in the December 2016 issue (Issue No. 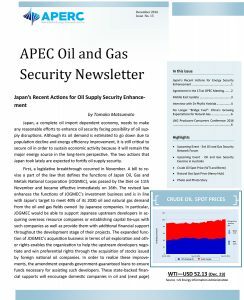 13) of the Oil and Gas Security (OGS) Newsletter released by the Asia Pacific Energy Research Centre (APERC). Click here to visit the newsletter archive page or read the full interview below. Dr. Yoshida was the former Lead Shepherd of APEC EWG. As such, she successfully led the working group to put together activities that will help in achieving APEC goals. APERC is fortunate to have her in this issue and share with you her thoughts and experiences. APERC: We understand that during your term at the U.S. Department of Energy (US DOE), you were responsible for implementing various administration policies. Does any of the policies involved oil or gas security issues in the U.S.? Dr. Yoshida: I was not directly responsible for U.S. oil and gas security but in my last position I often had to present U.S. oil and gas security policy and developments to other countries. Previous to that job, I ran our government-industry partnership on advanced technologies for the light vehicle industry. I consider that work an important part of U.S. energy security policy since it dealt directly with demand for oil. As your readers know, supply and demand are both important components of energy security. APERC: At the same time that you were working in the U.S. DOE, you were also serving as the Lead Shepherd of the APEC EWG. How long did you serve? Can you tell us the most memorable event or biggest accomplishments you had during your term? Dr. Yoshida: I took over the Lead Shepherd position from Australia in 2009, serving seven years. I did not plan to do it that long but the time went quickly. Every year energy was getting more attention within APEC and the APEC economies, and new opportunities were arising for cooperating together to meet shared goals. I was most proud of the degree to which everyone in the Energy Working Group worked hard together to develop substantive goals and activities that were widely recognized. In 2011 in the U.S. APEC year, I was able to accompany U.S. Energy Secretary Steven Chu to Hawaii where for the first time energy was a major item on the Leaders’ Agenda. As I sat in the 12th Energy Ministers Meeting in Cebu in 2015, I was struck that all the Ministers’ statements positively reflected and built upon the work we had done and the goals we had set as the Energy Working Group. APERC: During your term as the Lead Shepherd, were there cases during which you were confronted with threats of possible supply disruption in any of the member economies in APEC? If so, what were the causes — were they due to global oil and gas markets volatility, natural calamities, or geopolitical instability, among others — and how were they addressed? Dr. Yoshida: Luckily, we experienced no major disruptions. We did make sure that all the APEC economies were aware when the International Energy Agency and its members took an action in response to the prolonged disruption of supplies from Libya in 2011. We also undertook emergency response exercises and shared information on how members responded to national disruptions. For example, the United States presented on the response and lessons learned during and after Hurricane Sandy hit the U.S. Northeast in 2012. APERC: You are now associated with Sasakawa Peace Foundation USA, and you will still be working closely on Asia Pacific energy issues. Can you tell us briefly about your current work at the foundation? Dr. Yoshida: I am now Sasakawa USA’s Fellow for Energy and Technology. These both are relatively new areas for Sasakawa USA but ones which are growing in importance. I am developing new activities and research for 2017 that will include events on areas such as LNG, smart grid, and artificial intelligence/ robotics, as well as a book on U.S.-Japan energy relations. The Asia-Pacific is behind many of the changes in the global energy market, such as the supply of unconventional gas and oil from North America and the growth in demand for energy in China and SE Asia that are and will directly affect all of us. We are interested in determining what role Sasakawa USA can play in helping achieve a better public understanding of these issues. APERC: Finally, we learned that one of the missions of the Sasakawa Peace Foundation is to respond to any natural disasters, and we know as the Lead Shepherd how passionate you are about the works of EWG. Do you think a collaboration on oil and gas security between APEC EWG and Sasakawa Peace Foundation is possible? Dr Yoshida: Let’s talk! I always will have an interest in helping the APEC Energy Working Group achieve its goals, and would like to explore a possible collaboration. Sasakawa USA often partners with other groups as you can see by checking out our energy and technology webpage. Dr. Phyllis Genther Yoshida is the Senior Fellow for Energy and Technology at Sasakawa USA, with expertise in areas including Japanese energy policy, science, and technology policy; Japanese political economy; U.S.-Japan economic relations; Japan-U.S.-Asia energy and technology relations; and international energy and climate issues. Read more of her research and analysis here or read the Sasakawa USA Energy and Technology blog here.